An aerial view of the aftermath. The fire ravaged 8 blocks of the rebuilt boardwalk. 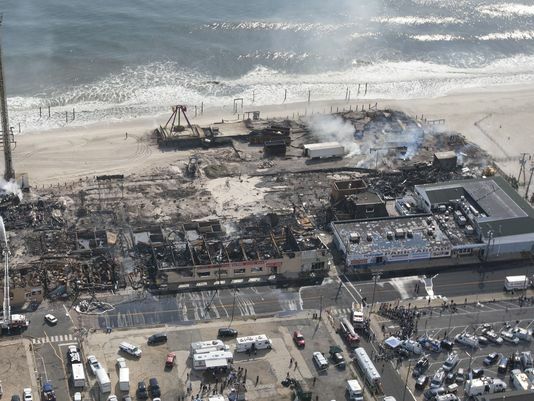 A ten-alarm fire on the Seaside Heights Boardwalk on Sept. 12, 2013 has left many local residents wondering if the popular Jersey Shore destination is cursed. Not even one year after being hit by Hurricane Sandy in Oct. 2012, the recovering boardwalk was engulfed in flames that spread quickly due to 30 mph wind gusts. The blaze started started at the very end of the boardwalk, at a Kohr Brothers Frozen Custard stand, around 2:15 p.m. The specific cause is still unknown at this time. The fire ravaged 80% of the boardwalk, spanning 8 blocks and damaging 32 businesses in its path. Valiant efforts by firefighters were unsuccessful for most of the afternoon as the fire took down the remains of the iconic Funtown Pier building. Water was drawn out of Barnegat Bay to try and douse the flames. New Jersey Governor Chris Christie declared a state of emergency around 7 p.m. By 7:45 p.m., the fire was reported to be under control, but firefighters were still seen stamping out the last hot spots as late as 10 p.m.
No serious injuries have been reported, but of the 400 firefighters who responded to the blaze, 12 suffered smoke inhalation, Seaside Heights Police Chief Thomas Boyd told USA Today. According to Seaside Park Mayor Robert Matthies, the fire was “A combination of the worst elements at one time,” a combination that the devastated shore town can’t seem to shake off. Next article12 Dead in Naval Yard shoot out in D.C.